When it comes to chainsaws, it’s always important to have enough power to ensure it can cut through what you need it too. In the case of this petrol-powered chainsaw from Parker, there is enough power for most sawing needs. At 62ccs, this is one powerful engine for a chainsaw. It offers enough juice for most casual sawing tasks, whether it’s chopping logs for the fire, removing a troublesome stump, or even taking down an entire tree – within reason of course! Better still, the 2-stroke, air cooled engine is petrol-powered (with a 3.5HP output), meaning it’s basically the most powerful type on the market while being completely cordless. Short of a professional chainsaw, you’ll struggle to find more cutting power than with this chainsaw from Parker. One of the bigger setbacks with petrol chainsaws such as this is the weight. 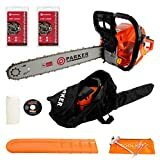 This is understandable given the powerful engine contained within, but this chainsaw from parker is surprisingly lightweight, especially when considering the cutting power. Weighing roughly 9kg, this chainsaw won’t cause fatigue as easily as other chainsaws in the same power range, while the ergonomically designed handle makes usability that bit easier. Better still, there is a fully integrated anti-vibration system installed, helping to further reduce fatigue when operating for longer periods. The cutting blade is another impressive aspect of the 62cc Parker chainsaw. For instance, it’s made from a highly durable alloy blade to ensure longevity, so you can safely saw through countless logs and timber without any weakening of the bar. Also, the chain for the bar is included with the original purchase, and there is even a second blade to replace the first! This is a great feature, as it highlights just how much value for money you can expect from the chainsaw – you won’t need to buy anything but petrol after the initial purchase. For comfortable and safe operating of the chainsaw, there is a side-mounted chain tensioner along with a fast-acting chain break. Furthermore, the chainsaw features an automatic chain lubrication system for easier maintenance. You probably won’t need to do much with this chainsaw after purchasing it, simply fill with petrol and change the chain after it dulls! When combined with the air-cooled engine, the blade of the chainsaw works amazingly well. It will cut through virtually any type of log, tree, or stump you can find with quickness and precision. Unless you’re planning on felling a massive tree out in the wild, this chainsaw will be more than enough for any job you have. Plus, it even comes with a free carry bag, bar cover, and tool kit, along with a user manual to get you started. When you consider the price of the chainsaw, this is another great bonus that highlights the outstanding value for money on offer. The Parker 62cc 20” Chainsaw is one of the best on the market in its price range. With a robust engine capable of sawing through most timber, you’ll struggle to find a chainsaw that performs this well for such a low price.